While awaiting my awesome Part.2 of how to set up Munki we will look at quick fix I made recently to troubleshoot AutoPkgr issues I was having. I have AutoPkgr set up with several sites as a quick and easy way to get updates of free and licensed software into Munki. Strangely, I ran into an error on my test box, and not on my deployments with clients. So it was something I had done, but what did I do? 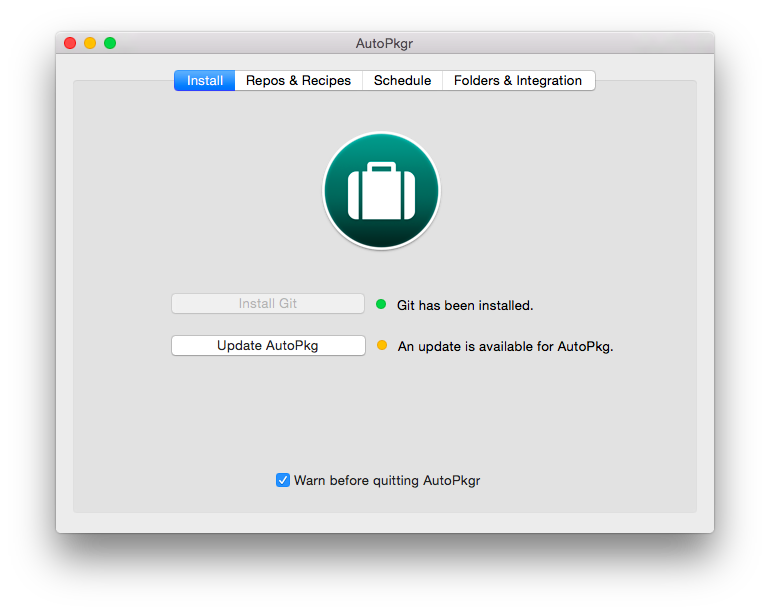 AutoPkgr is a very nice GUI front end to the excellent AutoPkg project. AutoPkgr installs Git and AutoPkg which are needed. AutoPkgr makes much of the set up much quicker and faster. It’s a great tool. Thanks to the Linde group. The best way to troubleshoot this issue with AutoPkgr is to see if it is an issue with AutoPkgr. 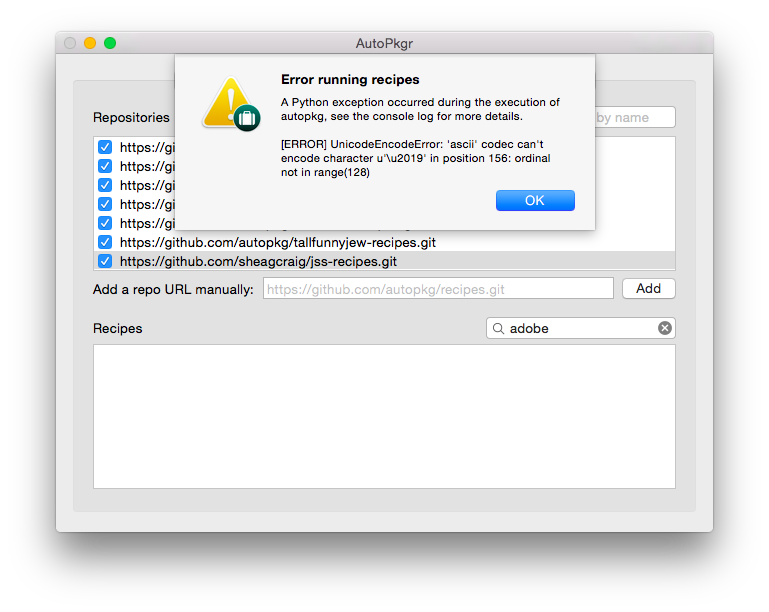 Let’s see if AutoPkg runs at all, and with the same errors. Now there’s an idea. So how do we run AutoPkg? Terminal. Open Terminal.app, and run AutoPkg directly. I always start with a basic “where is the app binary I want?” and then run the app with no options to see if there’s a help menu with an explanation of the switches. Looking at what Terminal says we now know that AutoPkg is installed in the path /usr/local/bin which is a very accepted place for non-standard (extra, or optional) binaries to live. We also know that “autopkg run all” is not the correct command to run, but it was enough to elicit a better error message. 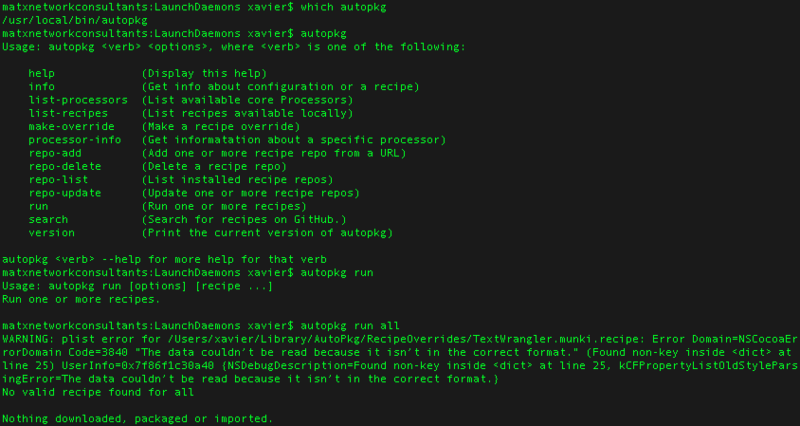 In fact, the problem seems to be a “plist error” with the TextWrangler override recipe. What’s that you might be asking? AutoPkg allows the use of “overrides” which adjust a recipe. In my use of AutoPkg I set an override to add information to a recipe, specifically developer and category information so that Munki’s Managed Software Update app correctly displays the information and the user has a more logically sorted software self-serve portal. In any case, we know from this error that something is wrong with the override. I can run xmllint and clean it, I can open and find the error, or I can just delete this override and re-run AutoPkg to see if we can get somewhere. In this example I run AutoPkg with the Transmit recipe and all runs well. Everything is good now. So what’s the lesson here? Be careful with your plist files. When you make your override, and add useful keys, double-check your work to avoid a broken AutoPkg.